Prerequisite: Make sure the product is published to Mothership. 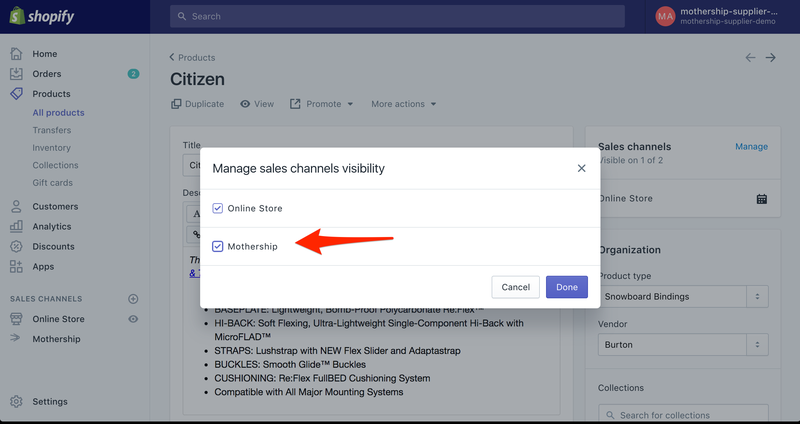 Before we begin, ensure that the product you want to add to a catalog is published to Mothership. 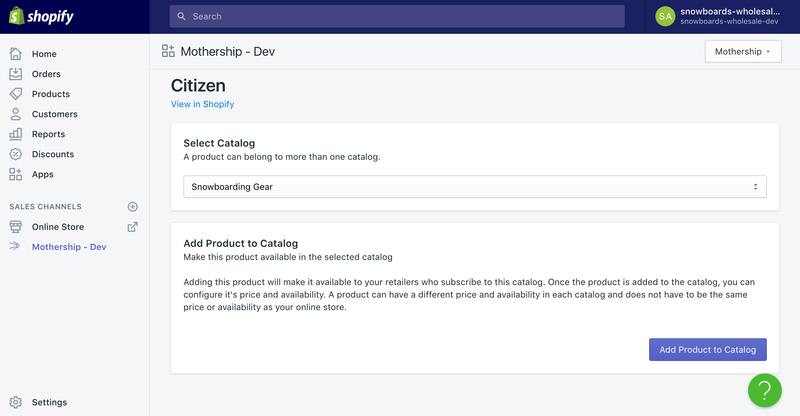 To publish a product to Mothership, go to the product's configuration page in the Shopify admin panel. Click on the manage link in the sales channel box in the upper-right hand corner of the screen. Click on 'Products' in the left-hand menu. On the next page, find the product that you want to add to your catalog and click on it's title. This should take you to page that looks similar to the one below. Click on the 'More Actions' button on the top, and then select "Configure in Mothership" (as in the image above). Select the catalog that you want to add the product to. If you're going through this the first time, there will be only one selection available. Next, click the purple 'Add Product to Catalog' button. You'll be taken to the page below. This page gives you all kinds of configuration information related to the product in the catalog. The values here are specific to the catalog selected. 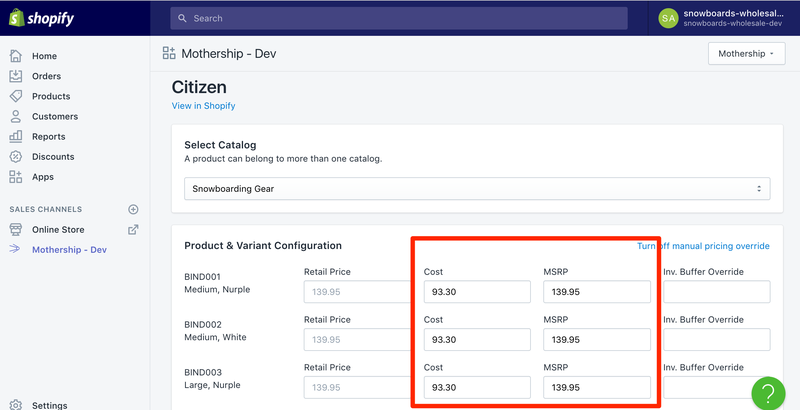 Since a product can belong to more than one catalog, the values associated with this product can vary from catalog to catalog. The SKU and options string on the left. The Manufacturer's Suggested Retail Price (MSRP). This is the retail price for the product variant found in your online store. Cost. This is what the retailer is charged when they purchase the product variant. Margin Override. 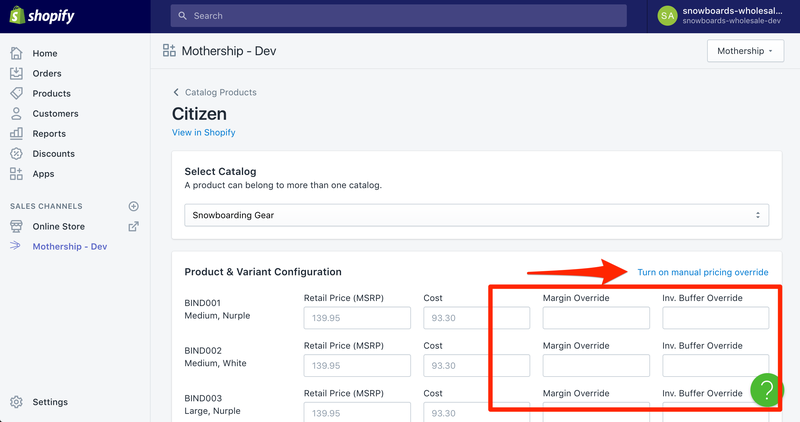 This lets you specify a margin value different from the catalog's default margin. Inventory Buffer Override. This lets you specify an inventory buffer different from the catalog's inventory buffer. 2. If you want to manually set the price for each product variant, you can do so by clicking on the "Turn on manual pricing override" link in the top right. You will then be taken to a similar page where you can specify the Cost and MSRP values.